An Avocado Tree with ripe and unripe Avocado blocks. 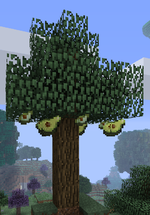 Avocado Sapling is a block added by the Pam's HarvestCraft mod. When planted on a Dirt or Grass block, it grows into an Oak Tree with Avocado blocks attached to it. The resulting trees drop Oak Saplings, as they are regular Oak Trees. Avocado Saplings can only be obtained through crafting. Avocado Sapling has no known uses in crafting. This page was last modified on 23 December 2015, at 16:13.